When it comes to running a homeowners association or condominium and all of the upkeep and operations associated with these types of properties, it is important to understand the ins and outs of insurance coverage and liability. For example, “bare walls” insurance plans are often discussed in associations that want to limit the cost of water damage claims because each owner (versus the homeowners association) restores their own unit interior (including cabinets, walls, and floor coverings, as well as other interior finishes). What Is “Bare Walls Coverage”? “Bare walls” coverage is a type of insurance coverage purchased by condo or homeowners associations which typically applies to communally-used features in buildings (such as entryways). Associations typically use costs that they charge in HOA fees to cover this type of insurance policy. However, it is the most limited type of coverage that an association can purchase. Individual unit owners are required to purchase their own insurance to cover anything that is damaged within their units (for example, toilets, appliances, etc.). The alternative type of insurance that an association can purchase is known as full or all-inclusive coverage (also known as “single entity coverage”). 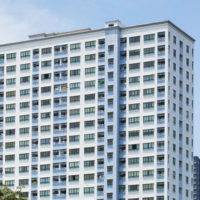 This applies to all the property on-site, including the individual units; however, it does not apply to unit owners’ personally-owned items, such as computers, clothing, etc. Single entity coverage is more commonly purchased by associations, as it also covers the cost of property improvements. While some do not necessarily prefer a bare walls system because it has the potential to expose an association to damage if the owner does not obtain proper interior insurance (and thus does not properly restore a unit after water damage), others feel that it is the best way to equitably share the risk of damage to the interior of the property. Otherwise, too much responsibility could fall on the shoulders of the homeowners association and potential claims against its policy, which then raises premiums. Regardless of which type of insurance policy your association goes with, individual unit owners should always have HO6 policies. In addition, associations can always obtain a modification or “endorsement” to their policy, which removes floor and wall coverings from its insurance coverage. Ultimately, homeowners associations should always discuss the pros and cons (costs and benefits) of each alternative with both their insurance brokers and legal counsel and each association should tailor their approach to their own individual needs. HD Law Partners provides the knowledgeable, proactive homeowners’ association legal representation you need. “Bare Walls” Or Full Insurance Coverage for Homeowners Associations: A DiscussionContact us today to find out more about our services.